Grossman, former Chancellor of the University of Massachusetts, Dartmouth, brings visionary leadership, health sciences research and innovation in higher education to role. San Marcos, California—January 22, 2018—The Board of Directors of the University of St. Augustine for Health Sciences (USAHS) has named Dr. Divina Grossman as President, effective March 1, 2018. Dr. Grossman, a tenured professor who previously served as Chancellor of the University of Massachusetts, Dartmouth, has more than 30 years of experience as a leader, practitioner, researcher and innovator in higher education. Dr. Wanda Nitsch, who served as president of USAHS for six years, had announced her plan to retire at the beginning of 2018. Prior to serving as Chancellor at the University of Massachusetts, Dartmouth, Dr. Grossman was the Founding Vice President for Engagement at Florida International University, where she also served as Dean of the College of Nursing and Health Sciences. She formerly was the Department Chair and Associate Professor of Chronic Nursing Care at the University of Texas Health Science Center at San Antonio. 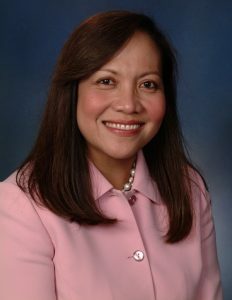 Dr. Grossman earned her PhD in Nursing at the University of Pennsylvania, Master of Science in Nursing at the University of Miami, and Bachelor of Science in Nursing at the University of Santo Tomas. She also completed the New Presidents Program at Harvard University. She is a lecturer, researcher, and widely published author on integrated health care topics. Throughout her career, Dr. Grossman has focused on community service and engagement initiatives that address the health and wellness of those in need. Through partnerships and pro-active outreach to local communities, Dr. Grossman has championed development of programs addressing community health needs, particularly in minority and disadvantaged populations. In addition to volunteering her time and expertise to local organizations and charitable groups, Dr. Grossman serves as Vice Chair and Board Member of Beyond Flexner Alliance – an organization of health professionals committed to equality of access to quality health care. The Board of Directors of USAHS conducted a comprehensive, inclusive, national search for a new president, with input from academic leadership, faculty, and staff, as well as representatives from each of the University’s campus locations. The full engagement and participation of the USAHS community in the search process were critical to the selection by the Board of Dr. Grossman. The University of St. Augustine for Health Sciences (USAHS) is a graduate institution that offers degree programs in physical therapy, occupational therapy, nursing, education and health science, as well as continuing education programs. Founded in 1979, USAHS has locations in St. Augustine and Miami, Florida; San Marcos, California; and Austin, Texas. USAHS is regionally accredited by the Western Association of Schools and Colleges Senior College and University Commission. USAHS completed a rigorous assessment by B Lab®, an independent non-profit organization that serves as a global movement of people using business as a force for good, and became a Certified B Corporation®. USAHS is a member of the Laureate International Universities network and Laureate Education, Inc. is a Certified B Corp® – the largest corporation ever to become a B Corp™. For more information about USAHS visit www.usa.edu.